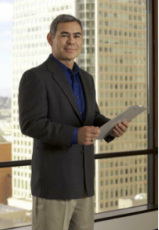 Carlos Santamaria is Founder and Principal of CEES Advisors. Formally with Glenborough, LLC for over 10 years as the Vice President of Engineering, Mr. Santamaria has worked in commercial real estate for over 25 years concentrating in energy efficiency, construction and operational best practices strategically positioning the company as a top performer and leader in energy efficiency and sustainability. Subject matter expert and industry advisor to the Building Owners & Managers Association (BOMA) International, BOMA California, BOMA China, The Department of Energy - Better Buildings Alliance, the Consortium for Building Energy Innovation, the Western HVAC Performance Alliance (WHPA), the California Community Colleges Chancellors Office (CCCCO), UC Davis Energy Efficiency Center, the New Buildings Institute and other associations. Assisted the National Institute of Building Sciences as member of the Building Operations Professional JTA Committee as a Commercial Workforce Credentialing Council Subject Matter Expert. Worked with City College of San Francisco on the development of an industry wide energy auditing program. Collaborated with ICF International and PG&E in developing training program for commercial HVAC contractors expanding energy efficiency skill-sets. Assembled several advisory committees and assisted in the training program role out and development of specific workforce training to program such as the; (a) The Control Systems Technology training at Chaffey Community College, (b) The High-Performance Building Operations Professional training at Laney College, and (c) The Facility Management (FM) training program. Currently assisting in the development of the Energy Analytics and Auditing program for the Bay Area regional industry sector. Mr. Santamaria has a BA in Business from Saint Mary's College and an MBA from the University of San Francisco. He also holds a California General Contractor license, California Real Estate Broker's license, holds a RPA Designation and is a LEED Accredited Professional – LEED AP. Mr. Santamaria is an international speaker as it relates to energy and sustainability implementation, new technologies, operational best practices and DEEP Energy Retrofit successes. Dr. O’Brien is a technology expert and project manager with over 20 years of experience in the management of multi‐million‐dollar programs related to the development and deployment of energy efficiency and renewable technologies and practices. One of the keys to the success of these projects is the ability to systematically resolve conflicting needs and provide an acceptable solution for a variety of stakeholders. This effort encompasses resolving regulatory and environmental issues, while still maintaining attractive return on investments for projects. The multi‐organization teams he has led combine OEMs, Engineering, Procurement, Construction (EPC) firms, technology developers, regulators, regional, and federal stakeholders. His international project experience includes Europe, Middle East, and Asia. He is a recipient of R&D 100 awards as well as awards for technology transfer. His firm is a member of WESTCARB, one of the Department of Energy’s Regional Partnerships, and is engaged on projects funded through the California Energy Commission (CEC) on the reduction of greenhouse gas emissions as legislated by Proposition 32 within the state of California. Dr. O’Brien also provided advisory services to the National Energy Technology Laboratory by building and leading a team that evaluated the portfolio of construction projects being funded by the American Recovery and Relief Act (ARRA). The project portfolio focused on sustainable solutions including: green building (LEED) design, design of enhanced HVAC systems, and the use of recycled materials in new construction. The team assisted NETL in establishing a methodology to monitor the progress of the projects as well as methods to rank and rate the projects. Mr. Stock has more than three decades of energy sector experience. As Director of Regulatory Relations for the Pacific Gas and Electric Company he represented the company before the California Public Utilities Commission on electric, gas, bankruptcy and workforce development issues. He has also represented PG&E at the California Energy Commission and the California Legislature as well as Congress on a range of energy issues. In addition he managed nuclear fuel and transmission contracting matters. Prior to joining PG&E Mr. Stock was engaged in project development, engineering design and research work for the CF Braun and General Atomics companies. Most recently Mr. Stock has been providing regulatory consulting services to the renewable energy sector. Mr. Stock earned degrees in Chemical Engineering from the University of California at San Diego and in Law from Whittier College. He is a member of the California Bar. Workforce Incubator (www.workforceincubator.org) builds industry, education, and government coalitions that cultivate world-class talent for 21st Century careers. Focusing on high-impact, high-demand, high-skill career fields, Workforce Incubator convenes and facilitates the work of leaders to amplify career relevance for displaced workers, career-changers, and students from high school through college. It builds upon a number of models for career-relevant learning that were pioneered by the Gates Foundation, the Irvine Foundation, and others. Workforce Incubator cultivates a world-class talent pool that meets the priority needs of industry, enabling participants to compete successfully in the global economy, through the guidance of professional educators of the highest quality in close collaboration with industry, government, and nonprofit organizations. Workforce Incubator is a strategic partner with EIEE for integrating workforce programs into market development initiatives.